It was one year and two days after the October Revolution had brought the working class to power in Russia. For the Russian revolutionaries the outbreak of the German Revolution brought an end to the agonising debate over the signing of the Treaty of Brest-Litovsk eight months earlier. Those who had argued that this Treaty would allow the German government a new lease of life and strangle the German working class had been proven wrong. The German revolution, which Trotsky, Lenin, Bukharin, and indeed the entire Russian revolutionary working class, had counted upon to turn their audacious act of October 1917 into a real world proletarian revolution, was now on the march. Or so it seemed from several hundred miles away in Moscow. In reality the situation was much more problematic. For a start, the counter-revolution was already being prepared weeks before the workers and sailors rose in revolt. In September Ludendorff, at that time Chief of the General Staff and virtual dictator of Germany, told the Kaiser that his famous offensive begun as the Treaty of Brest-Litovsk was being signed had been halted, and the German Army was now in retreat. The question now for the German ruling class was how to get out of a lost war with the minimum of damage. They put their faith in President Wilson’s Fourteen Points for a “just a lasting peace” announced in January 1918 as a deliberate propaganda response to the Russian Revolution. Lenin’s first Decree on Peace had raised a banner for the world working class and thrown down a challenge to the imperialist order. Wilson’s Fourteen Points were intended to neutralise this appeal of the Russian Revolution to the world’s workers. The German Generals, reactionaries to a man, now tried to use this piece of democratic propaganda to get out of the war. However it soon became clear that neither they nor the old imperial regime would have any credibility in discussing a “democratic peace”. Thus they consulted the leaders of the majority Social Democratic Party. This was not new for them. They had discussed with them before the war to ensure that the Social Democrats would not sabotage the war effort and were rewarded, when, to the astonishment of the world, the German Social Democratic Party reneged on its own past (“not a man, not a farthing for this system” their leader August Bebel had announced years earlier) and on every international resolution it had agreed to, in voting a war budget for the Kaiser.1 The party signed up to the Burgfriede2 with the Kaiser. Thus German workers were disarmed overnight. The Burgfriede lasted until April 1916 when the SPD split and the so-called Independents of the USPD left, having denounced the Majority Socialists for betraying socialist principles by supporting the Kaiser. However, the Independents were pacifists with no critique of imperialism. The USPD only called only for a peace where no country would annex territory or pay damages to another. They did not even call on the working class to actively oppose the war. These tasks were left to the smaller groups which had already exited Social Democracy over its support for the war. The clearest of these were the Bremen Left around Johann Knief and Paul Fröhlich, who also received support from Karl Radek before he was deported to Russia. They took many of their positions from the Dutch Tribune group of Herman Gorter and Anton Pannekoek which itself had broken with the Dutch Social Democratic Party in 1909 over the issue of organisation. Along with other groups in Brunswick, and the Lichtstrahlen group in Berlin, they were the forerunners of the German communist left. They stood for Lenin’s policy of turning the imperialist war into a civil war which he had presented to the Zimmerwald Conference in 1915. It was after this conference that these groups fused to form the German International Socialists (ISD). In November 1918, the ISD fused with Rühle’s Dresden group and the Hamburg Left Radicals to form the German International Communists (IKD). However this was still a relatively small and ineffectual grouping with few roots in the working class. the International Group actually added to the “heterogeneous” nature of the USPD by joining it if with its own separate platform. This was a tragedy for the German proletariat, since the USPD was not really “independent” but full of all the “revisionists” in Social Democracy like Bernstein, like the “renegade” Kautsky – as Lenin called him. Even Rosa Luxemburg, the other famous leader of the Spartakists, had spent the last twenty years fighting for a revolutionary perspective inside Social Democracy yet could not bring herself to break completely from the very foes she had tackled. At the beginning of the war, when urged to break with the SPD, she had replied that “better the worst working class party than none at all”. This was to gloriously miss the point. Her Junius Pamphlet was the programmatic basis of the Spartakists and although it contains a brilliant critique of the Majority Social Democrats it is still written with a view to changing the nature of Social Democracy. She did not see that the war had demonstrated that the era of the mass party was over and with it any revolutionary role for social democracy. There was no longer any ambiguity that the SPD was integrated into a system it claimed to oppose and accepted collaboration with the capitalists to preserve the system. The Social Democratic Party still regrouped thousands of workers but it was no longer a workers’ party. In no sense did it represent the interests of the working class. It is no accident that almost the entire union leadership of Social Democracy sided with the Majority leaders like Ebert and Noske who had once been union officials themselves. Their entire existence was bound up with negotiating with capital. And yet Luxemburg still feared to make a complete break. The USPD themselves were expelled from the SPD (they did not open the breach themselves), and the Spartakists were now hanging onto its coat-tails. The argument the Spartakist leaders used for remaining in the USPD was that they would be in a position to win over its more revolutionary members when the inevitable split came. In fact the opposite was the case. As part of the centrist USPD, the Spartakists did not even side with the working class anti-war positions of Lenin and the other smaller German groups at Zimmerwald and Kienthal (the so-called Zimmerwald Left). At every turn the Spartakists failed to distinguish themselves organisationally and dissipated any momentum that they gained from the anti-war activities of Liebknecht and Luxemburg. Indeed, their principled opposition to the war was all but forgotten once the November armistice was signed. Unfortunately, this was a perspective rather than an urgent course of action and so there was no split with the USPD, and no attempt to rally the smaller left groups. For their part these groups, had largely tactical, though quite serious, political differences with the Spartakists over parliamentarism and trades unionism. But most German revolutionaries who formed the Communist Party were guilty of localism and federalism at a time when not only a new German party was needed but also a new International. Thus the Spartakusbund simply translated its own federalist structure into the new Communist Party which cannot even be said to have had a Central Committee in the effective sense. and they did everything to convince the workers of their working class credentials. The regime banned Vorwärts, the SDP paper to give credence to their claims and Ebert even addressed an illegal meeting (though he was never arrested whilst Dittman of the USPD was gaoled for 4 years for addressing the same meeting). Ebert now offered to negotiate the economic demands of the strikers with the government and the revolutionaries on the committee, having as yet prepared nothing else were forced to accept this and the strike ended in confusion and demoralisation. The government then carried out reprisals sending one in ten of the most militant strikers to the front, thus removing a potential leadership for the next round of the class struggle. But the final patriotic act of the Ebert-Schiedemann-Noske leadership for German capitalism came in November 1918. The German General Staff, made up largely of Prussian landowners, having lost the war to save the Empire, were now turning to the question of saving their class privileges. They persuaded the Allies at the armistice negotiations to allow them to retain thousands of machine guns to “preserve social order” and even set up secret units in each regiment who would be armed and purged of “unreliable elements” in preparation for the coming struggle at home. As the Allies had allowed the German troops to march peaceably with arms back to barracks in Germany the bourgeoisie also organised “victory parades” for them on their return! This did not quite work out as planned since most rank and file soldiers deserted as soon as they could once back in Germany but it not only left the 250,000 strong officer class in control of an arsenal, it also fed into a nationalist campaign that was the precursor to class war. The final and most important element in the General Staff plan was to get their “class opponents” to save their society. Negotiations to bring the SPD into government and present the necessary democratic face to accept Wilson’s 14 points had been going on for a month when news of the sailors’ mutiny in Kiel reached Berlin on at the end of October. On November 4th Noske was sent to Kiel on behalf of the General Staff-SPD alliance. By this time, the first soldiers’ council of the German revolution had come into existence and Noske saw he would not be able to persuade the sailors to return to their ships or surrender their arms. Instead he used his “socialist” credentials to declare himself the head of the movement and this was not challenged by anyone. The USPD supported him in the name of “proletarian unity” and, as the Spartakists were still in the USPD, they had no independent basis for fighting this. In the meantime the revolution was on the march. Hamburg, Bremen, Hanover, Brunswick, Cologne, Munich, Leipzig, Dresden, Chemnitz, Frankfurt, Dusseldorf, Stuttgart, and about 100 towns, all followed Kiel in setting up workers’ and soldiers’ councils. Germany’s petty princes were now driven from their palaces. On 9th November they were joined by the Kaiser himself. 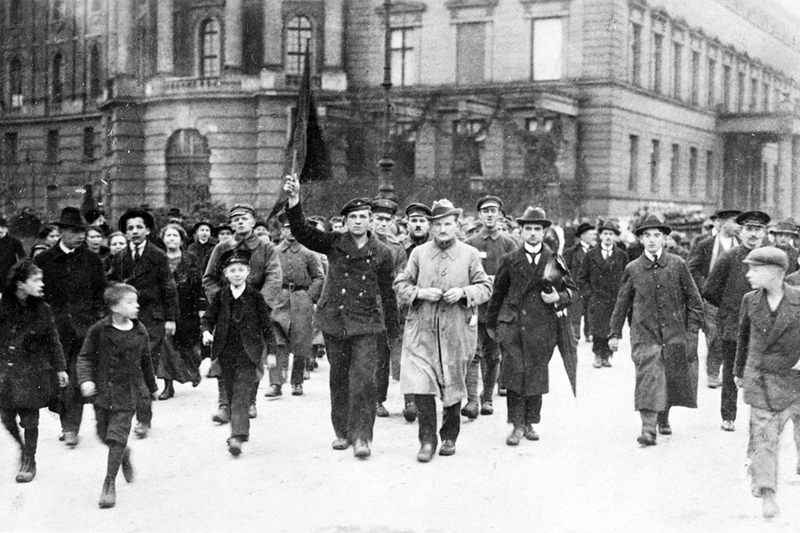 In Berlin, workers took to the streets led and organised by the Revolutionary Obleute.7 The police gave their arms to workers and soldiers left their barracks. Some officers did fire on workers (three were killed) but most recognised that further resistance was futile. By lunchtime, Prince Max of Baden, the Prime Minister, was announcing the abdication of his cousin, the Kaiser. The next day he resigned and handed over to Ebert. The SPD now moved quickly. They hastily formed a Berlin “workers’ and soldiers’ council in the offices of their paper, Vorwärts and called on Berlin workers to send delegates to an assembly the next day. USPD leaders could not believe the chutzpah of these “Kaiser socialists” but still went along with them in the interests of “socialist” unity. The council movement that was spreading all over Germany was forcing these inveterate parliamentarians to take the lead inside them but with the clear aim of liquidating them as soon as possible. And, dominated as they were by the soldiers (and by this time it usually mean officers) and the Social Democratic Majority, they were not even in form like the Russian soviets. Whilst the latter had been born in the streets and on the shopfloor of the productive units of society, the council movement in Germany often sprang from the decisions of the political parties and the trades unions when faced with a mass revolutionary movement. Nor were they uniquely proletarian, as Carsten demonstrates. And throughout the report he keeps asking the same question “where was the Spartacus League?” His answer comes soon enough. And this was to be a theme repeated many times over in the months ahead but Leviné presciently recognised what the Spartakists now had to do. Here was the first tragedy of the German Revolution. Luxemburg, in particular, had refused to organisationally separate from the mainstream of Social Democracy. Her view that “better the worst working class party rather than none at all” was in many ways a reflection of the general class consciousness of German workers who could not see that the SPD Majority were not simply mistaken or opportunist. They had crossed over to the other side of the class barricades. There was no working class party as such left. Thus the Spartakists never raised a separate banner around which the revolutionary working class could unite. They were incapable of making a decisive criticism of Social Democracy and even when the split occurred they did not strike out on their own but did a deal to work within the USPD who themselves had a feeble pacifist position on the war. Indeed, the formation of the German Communist Party (KPD) would not have taken place by the end of 1918 if it were not for Karl Radek who persuaded the International Communists of Germany (IKD) to invite union with the Spartakists so long as the latter broke from the USPD. Only when the USPD rejected Luxemburg’s call for a Party congress on 24 December was she left with no other option but to set up the KPD. And as Leviné so dramatically discovered, the lack of organisational independence from the USPD at this time condemned the Spartakists to impotence. German Social Democracy had been brilliant at facing two ways at the same time by having a maximum and a minimum programme but, when imperialist war demands “whose side are you on” then a split along class lines is inevitable. Avoiding this split meant that the German Communist Party was born very late in the revolution when, as we have seen, the counter-revolution was already on the march. However, even now, all was not lost. Two days before the opening of the disastrous Congress of Soldiers’ and Workers’ Councils Rote Fahne (Red Banner) had published Rosa Luxemburg’s draft programme What the Spartakist League Wants. This was the first step on the road to the formation of a revolutionary party. Given the lack of preparedness of the German working class (as shown by the Congress of Soldiers and Workers Councils) this perspective contained a recognition that there would have to be a considerable period of work and preparation at the grassroots before the German proletariat would go beyond the limits imposed on the revolution so far by the Majority Social Democrats. Why then did the Spartakists take part in a putschist adventure little more than a week after the new German Communist Party had come into existence? This is one of those issues where the combined actions of all the participants end up creating a tragedy. Having failed to break with Social Democracy early enough, there was no body of common experience amongst the various delegates of the KPD. Add to that the tradition of German localism and you end up with a party which designs a Zentrale to lead it but without ascribing precise roles to its members. The KPD as a whole rejected parliamentarism as the way to socialism, but there was disagreement on whether to tactically participate in elections to the new National Assembly. The abstentionists triumphed in the vote despite Rosa Luxemburg’s intervention in favour of participation. The abstentionists triumphed in the vote despite Rosa Luxemburg’s intervention in favour of participation. On January 5, the Revolutionary Obleute called for a demonstration against the dismissal of the Berlin USPD Police President Emil Eichhorn by the Ebert government, in which the KPD also participated. The demonstration was so well attended that the same evening representatives of the three organisations decided to form a provisional revolutionary committee, including Liebknecht of the KPD. All Liebknecht’s weaknesses were now to be exposed. A courageous but impulsive and egocentric individual at the best of times, he was also not used to acting within the discipline of a real revolutionary organisation. Without consulting with his colleagues in the leadership of the KPD, Liebknecht put his, and the Party’s, name to a proclamation of the Revolution-Ausschuss (revolutionary committee) which declared it had “deposed” the Ebert Government. These, however, were just words since there was no coordinated plan as to how this was to be done. Young KPD members joined with other elements from the USPD, and those proletarians who had been waiting for this opportunity, now seized newspaper offices and started skirmishing with the police. Luxemburg and her allies were appalled (she is alleged to have asked Liebknecht “what had become of [their] programme?”) but they were caught between a need to defuse the situation and a desire not to abandon the workers who were already on the streets. Radek, who was present in Berlin, called upon the KPD leaders to repudiate the movement saying it was just like the July Days of 191715 in Russia. But then the Bolsheviks in July 1917 managed to tread a fine line. They neither denounced the movement nor ever quite went along with it. This itself had been no tactical masterstroke since it still led to the suppression of the Party. Only the fact that the Bolsheviks had already put down roots inside the working class meant that they could hold on and recover. Without those deep roots in the working class, the July Days would have been an utter disaster rather than a temporary setback. The KPD still had to put down those roots, and in this crisis it did not even have control over its own forces on the ground, let alone those of the USPD. Its late appearance and its failure to sort out both a clear organisational structure, its indiscipline, plus its lack of a body of practice in the face of the devious defence of capitalism by the so-called “socialists” of the Majority SPD, meant it was largely unprepared for the complex situation of 1919. The German proletariat was to pay a heavy price for this. The heavy price was paid not just in the massacres in cold blood of hundreds of workers and communists (including Luxemburg and Liebknecht themselves) but it was to permanently split the revolutionary proletariat in Germany. The split in the KPD which led to the formation of the KAPD, and the failures of the revolutionary attempts of the March Action in 1921 and again in November 1923 were all consequences of the original sin of not building a functioning proletarian party after 1914. The tragedy is further compounded when we recognise that in the social conditions of 1919 the revolutionary crisis did not go away easily. As the history of the next four years showed the bourgeoisie were also divided about the nature of the new Republic, and opportunities for a genuine revolutionary movement to defeat their class enemies would arise again. But whilst the KPD oscillated from opportunism to adventurism and became increasingly a tool of a degenerating Third International, the KAPD was riven by localism, syndicalism and councilism, and thus was to disappear with the end of the revolutionary wave. For the working class, precisely because it was so critical to the extension of the world revolution, the history of the failure of the German Revolution makes depressing reading, but its study is probably worth more in terms of what it teaches us than even the victory of Bolshevism in far off 1917. The above article is based on a version originally published ten years ago but it has been substantially edited with the assistance of our comrades in the Gruppe Internationaler SocialistInnen (Germany) to whom we offer our thanks. 2. From the medieval German tradition where any knight could enter any castle or town provided he swore to uphold “the peace of the castle” or burgfriede. 3. Militarism and Anti-militarism. It was based on a speech he gave in 1906. He was tried for treason and gaoled for 18 months during which time the workers of Berlin elected him to the Prussian Landtag, and later, to the Reichstag. 4. Quoted in A.J. Ryder, The German Revolution, p.82. 7. Obleute is usually translated as “shop stewards” but these were more like coordinators of sections of workers in the Berlin metalworking industry. Politically they were close to the USPD leader George Ledebour so the “revolutionary” label has to be considered with care. 10. Taken from the appendices to Rosa Leviné-Meyer, Leviné, Life of a Revolutionary, Saxon House, 1973, p.189ff. 13. Trotskyism in its various shades has always suffered from this illusion and this was why Trotsky himself showed the way with his “French turn” in 1935 where he urged Trotskyists to go into Social Democracy to work secretly to radicalise it. 14. This version is taken from The German Revolution and the Debate on Soviet Power, Pathfinder, 1986, pp.119-121. 16. See Werner Angress, Stillborn Revolution, Princeton 1963, p.35. "but its study is probably worth more in terms of what it teaches us than even the victory of Bolshevism in far off 1917." The Bolshevik "victory" meant the defeat of the revolution. Aping Bolshevism in Germany helped defeat the revolution there too. But, then, the main problem in Germany was the decades of Marxist ideology in the labour movement -- turning to "radical" social democracy (i.e., Bolshevism) would never achieve socialism simply because social democracy was not socialist. Its centralist, electioneering nature (as urged by Marx and Engels) could not help become reformist and authoritarian, as Bakunin predicted. Oh, while I'm here -- why are these want-a-be Bolsheviks on a libertarian website? Anarcho, you're like a broken record. were maybe bigger points than others which even an earlier formation of a minority genuinely revolutionary leadership would have struggled to overcome? Perhaps different objective material conditions in both Russia and Germany were seen in retrospect to be against the prospects of a genuine communist revolution even if more might have been salvaged for the future? the agonising debate over the signing of the Treaty of Brest-Litovsk eight months earlier. Those who had argued that this Treaty would allow the German government a new lease of life and strangle the German working class had been proven wrong. I wonder how the author felt being vindicated thanks to the strength of the Entente Imperial militaries. Good thing those 50 Eastern divisions weren't enough to capture Paris in the Spring offensives, or we wouldn't have a centenary to celebrate. I'm not a fan of Anarcho and I feel this strategy of repeating the criticism in the comments of multiple entries doesn't seem very productive. But he has a point, and I don't think its been addressed or answered at all. This article isn't libertarian, at all, but more importantly it doesn't have any value for Libertarians, its designed to promote the Bolshevik model vanguard model. If you edited it a bit you could probably get this article published in ML or Trotskyist newspaper. The heavy price was paid not just in the massacres in cold blood of hundreds of workers and communists (including Luxemburg and Liebknecht themselves) but it was to permanently split the revolutionary proletariat in Germany. The split in the KPD which led to the formation of the KAPD, and the failures of the revolutionary attempts of the March Action in 1921 and again in November 1923 were all consequences of the original sin of not building a functioning proletarian party after 1914. I have actually seen passages just like this in their newspapers and essays, often in the same context, a situation where political parties did take part and often tried to take the lead and more often than not got in the way. From which they bizarrely conclude that what we really need is another party (why maybe ours?) to take a lead. What this is doing is saying if you want to build workers power, what you need to do is build up a powerful political party with a highly centralised bureaucracy and leadership and do what it says. So why is it here? If people are into this sort of thing why don't they just go to the ICT's website? What benefit do we get out of it? It has historical information but this site already has a lot of stuff covering the same subjects without stretching them to fit this questionable agenda. Is that a diss or a compliment? That's true. "We don't accept the term "libertarian Marxist" as for real Marxists, Marxism is libertarian or it is nothing. Stalinism etc. is not Marxism." I have actually seen passages just like this in their newspapers and essays, often in the same context, a situation where political parties did take part and often tried to take the lead and more often than not got in the way. From which they bizarrely conclude that what we really need is another party (why maybe ours?) to take a lead. What this is doing is saying if you want to build workers power, what you need to do is build up a powerful political party with a highly centralised bureaucracy and leadership and do what it says. Our view of the party is much different to that of the Stalinists and Trotskyists - the comparison borders on offensive. The working class cannot "delegate to others its historical mission, and it does not give power away, not even to its political party." But a political organisation is a necessary tool in the hands of the working class - even some anarchists would agree with that. Are you anti-organisation? Because we've been invited by one of the libcom admins to set up a blog. Clearly at least they thought our contributions were interesting and relevant enough! Perhaps reddebrek should think about a new definition for libertarian because I would have thought it wouldn't include banning texts by those that libertarians don't agree with. Reddebrek approach is even odder considering he has just posted a load of pdf's include documents from groups who believe the same as the CWO!!!!! It's not banning, it's discussing whether it should be hosted. "Banning" is something that only the state can do; after all, if this wasn't published on libcom, it could be hosted somewhere else for everyone to read, someone could even have posted a link to it from here. There are lots of texts that have been removed from the libcom library for various reasons.Now my personal opinion on this is to just host the damn texts and let the readers interpret and read the discussions underneath blog posts and library articles, but shouting about "banning" as soon as someone questions, rightly, why a a text that seems to argue for a vanguard-party, is somewhat hysterical (for lack of a better word). I didn't say Libertarian Marxist so I don't really care if you use it or not. Would you care to address the substance of my criticism here instead of trying to win a word game you're playing by yourself. See again your using a very typical ML and Trotskyist word trick whilst arguing you're nothing a like. Your substitution trick "organisation is what we practice, you disagree with that therefore you must be anti organisation". Is the standard justification for virtually every top down political group I've ever encountered regardless of trappings and favourite book quotations. You know appealing to authority is a logical fallacy right? I mean they have also let ML and Trot stuff in here too so might not be the best defence given your other stated views here. That's not what I said at all, but I am amused that you think this transparent caricature is supposed to be a gotcha. Would you care to address the substance of my criticism here instead of trying to win a word game you're playing by yourself. What is the substance of your criticism? As far as I can see, it's that this article understands the need for a political organisation (aka a party) therefore it is not "libertarian" and so does not belong on libcom. You see the word party, and you cry "Stalinist! Trotskyist!". It's guilt by word association. Nowhere do we call for a "a highly centralised bureaucracy" and the working class just doing what it's told from above. It's not favourite book quotations. It's excerpt from our articles, which explain our understanding of the process of counter-revolution in Soviet Russia, and the role of the party. I've referenced them because, to compare us to Stalinists and Trotskyists, you must be either a) unfamiliar with our positions, or b) intentionally distorting them. You asked why this is here. I told you. Because we've been invited. Some libcom users may find our content interesting and useful, others may not. That's alright.